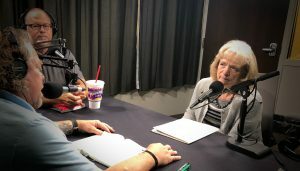 This week Bill moderates a discussion between Gayle Ruzicka, the president of the Eagle Forum and “political has been,” Steve Urquhart about Prop 2 and medical marijuana. This entry was posted in Podcast Episodes and tagged Bill Allred, Eagle Forum, Gayle Ruzicka, medical marijuana, Politics, Prop 2, Steve Urquhart. Bookmark the permalink. This would have been a lot cooler if Bill and Gail had let Steve have some time. Gail was quite rude about constantly talking over Steve and Bill let it go. Very unpleasant. I thought I was listening to a parody of Rosanne as a Mormo- er… member of the Church of Jesus Christ of Latter Day Saints. I also wondered if it was Sister Dottie because I couldn’t believe Gail was a real person. The problem with the Prop-2 dust up is that Utah’s legislature and fellow Goodfellas are working feverishly before their time runs out to find a way to control a Marijuana production and sales chain that is designed to benefit their select, insiders, nominees, and cutouts. The insiders will be favored sons and daughters … Goodfellas … controlling the “Pot” processes throughout. We like to call the newly visioned entity “UPOT” after several other corrupted quasi governmental entities like UTA, USTAR, DABC … you get the drift?